LAS VEGAS (March 4, 2015) - The Las Vegas 51s professional baseball team of the Pacific Coast League (PCL), Triple-A affiliate of the New York Mets and the 2013 & 2014 Pacific Conference Southern Division Champions, announced today they have teamed up with Comprehensive Cancer Centers of Nevada (CCCN) to offer complimentary sunscreen at Cashman Field during the 2015 baseball season. The sunscreen will be available beginning with the Big League Weekend "day game" between the Chicago Cubs vs. Oakland A's on Saturday, March 14 at 12:05 p.m. CCCN medical oncologist Dr. Paul Michael will throw out the ceremonial first pitch at the game. Fans will be able to protect themselves from potentially harmful UV-A and UV-B rays by visiting one of two CCCN sunscreen kiosks on the main concourse at the ballpark. Additionally, skin-safety messages will be displayed on the videoboard and public address announcements will remind guests to stay proactive with skin protection. Cashman Field ushers will also have a supply of complimentary sunscreen available for fans, so they may conveniently reapply during the game. "Awareness as well as a preventative approach are critical in preventing skin damage and potentially skin cancer," said James Kilber, executive director of CCCN. "So many of our local families enjoy a trip out to Cashman Field each year. We hope everyone will take advantage of the free sunscreen and skin safety messages this season as they cheer on the 51s to victory." The partnership offers complimentary SPF 30 sunscreen to the projected 300,000 plus fans that will visit Cashman Field throughout the summer. 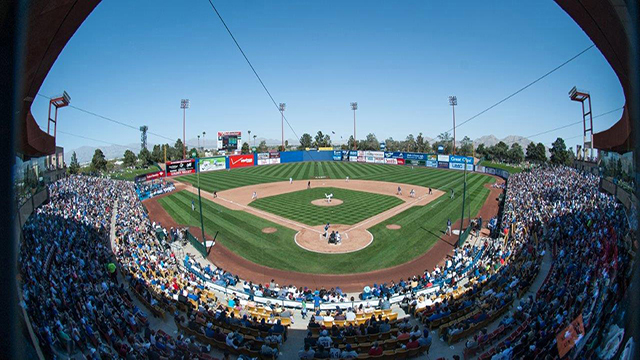 The 51s have 11 day games scheduled at Cashman Field during its 2015 season. "We are excited with the partnership with CCCN and it will provide the fans at the ballpark an opportunity to apply sunscreen during the matinee games at Cashman Field," 51s President/COO Don Logan said. "The awareness of skin cancer is very important and with the help of CCCN, it will provide a safer experience for both the players and fans this season." The 51s open their 33rd season of play in the Silver State against the Fresno Grizzlies, Triple-A affiliate of the Houston Astros, on Thursday, April 9 at Chukchansi Park. Las Vegas will begin the 2015 campaign with an eight-game road trip in Northern California against Fresno (April 9-12) and the Sacramento River Cats, Triple-A affiliate of the San Francisco Giants, from April 13-16. Las Vegas' home opener will be on Friday, April 17 against Fresno at 7:05 p.m. at Cashman Field. Season tickets and mini-plan packages (11, 22, 36-game plans) are available by calling the 51s office at (702) 798-7825. Individual game tickets for the 72-game home schedule will go on sale in March. The Las Vegas 51s have the proud distinction of being the longest enduring franchise in the history of professional sports in the state of Nevada. Las Vegas Triple-A baseball was born on April 10, 1983 before a crowd of 10,622 at Cashman Field. The 2015 Pacific Coast League baseball season will mark the 33rd campaign in the Silver State (1983-2014). Las Vegas franchise has reached the 300,000 plateau in "home" attendance in all 32 seasons and the all-time attendance total stands at 10,644,209. The Las Vegas affiliation history includes: 18 seasons (nickname Stars) as the Triple-A affiliate of the San Diego Padres (1983-2000); eight seasons with the Los Angeles Dodgers (2001-08); four seasons with the Toronto Blue Jays (2009-12) and two seasons with the New York Mets (2013-14), the past 14 seasons nickname 51s. Las Vegas captured the PCL Championship in 1986 and 1988. Comprehensive Cancer Centers of Nevada (CCCN) is an award-winning multidisciplinary oncology group comprising medical oncology, hematology, radiation oncology, breast surgery and clinical research, with 11 treatment centers and offices throughout Southern Nevada. For more than 35 years, the practice has provided oncology services to patients in and out of state with a specialized physician and nursing staff. This team of medical professionals offers sophisticated diagnostic tools, the latest advances in cancer treatment, a full range of innovative, exclusive services and research-based care in a supportive and caring environment. CCCN is accredited by the American College of Radiology, certified by the Quality Oncology Practice Initiative and affiliated with The US Oncology Network (www.usoncology.com), one of the nation's largest networks of integrated community-based oncology practices dedicated to advancing high-quality, evidence-based cancer care. As an affiliate of The US Oncology Network, CCCN is united with nearly 1,000 physicians nationwide. The practice is also affiliated with the UCLA Jonsson Comprehensive Cancer Center, one of the field's most respected authorities in cancer research and treatment. Comprehensive Cancer Centers of Nevada has played a role in 52 FDA-approved cancer therapies, nearly one-third of all cancer therapies approved by the FDA to date. For more information, visit the company's web site at www.cccnevada.com, and follow the practice on Facebook at www.facebook.com/cccnevada and Twitter @CCCNevada.